"Mahalo" means thank you in Hawaiian. 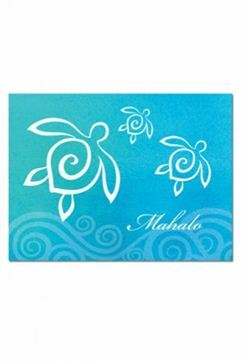 Our Honu Swirl Mahalo Cards are wonderful ways to send Hawaiian-style greetings to friends and family. Each card is blank inside and includes 10 cards & envelopes. Cards measure approximately 5" x 3-3/4".